Brazilian Dinner Made Easy — Dine on In! I'm obsessed with social media posts with cultural cuisines I find that with such cuisine comes even a greater story. I'm always impacted by these posts, as they come with so much history behind them as this dish does that I'm about to share with you. Its called Feijoada. (Fay- ho- Ada) [I imagine that is how it's pronounced]. It's a slow cook pork meat made succulent and intense by cooking long and slow with spices. It paired with black beans, collards and white rice. The quintessential home cooked meal. I imagine large families together at a dinner table and sharing stories of their day. I imagine children, picking up the meat with their chubby little hands (because I love chubby hands on children), devoting each decadent piece of meat and beans and greens and rice (run on sentence because I imagine that is precisely how they would describe it to you). I saw this post on Facebook and instantly shared this- it's seemed so simple- so rich and the prefect comfort food for MY family. I used my crockpot to cook a pair of boneless pork chops that i had in my freezer, which I thawed overnight. I just got back from the market so I had collard greens (we love collard greens and buy them often) and black beans. I also had kumquat jam from a friend who made a fresh batch from the seasonal batch he had. As always, I have vegetable stock on hand so that was also added. Cooking in crock pot isn't so complicated. I marinated 2 boneless pork chops with 1/2 cup of kumquat jam*, and set them aside in a bowl while I prepped the rest. I chopped up 1 onion in large pieces and added to the bottom of the crock pot. I then took 1 1/2 cup of vegetable stock and added to crock pot. I added 1/3 cup of black beans to mixture and the topped with the marinated chops. I cooked on high for 6 hours. Cook the white rice per directions (hint use the leftover vegetable stock- it adds such great flavor to rice! )- and also sautée the collard greens (I like using a tsp of butter then at the last minute adding a splash of the vegetable stock, but you can also sautée with oil if you're dairy free). When it's all ready, put it all together, call your family (or not- I REALLY didn't want to share lol) and enjoy. This dish, is something you should make when you have a large group of people over- it's pretty for family style eating. It's so easy. It's so pretty. 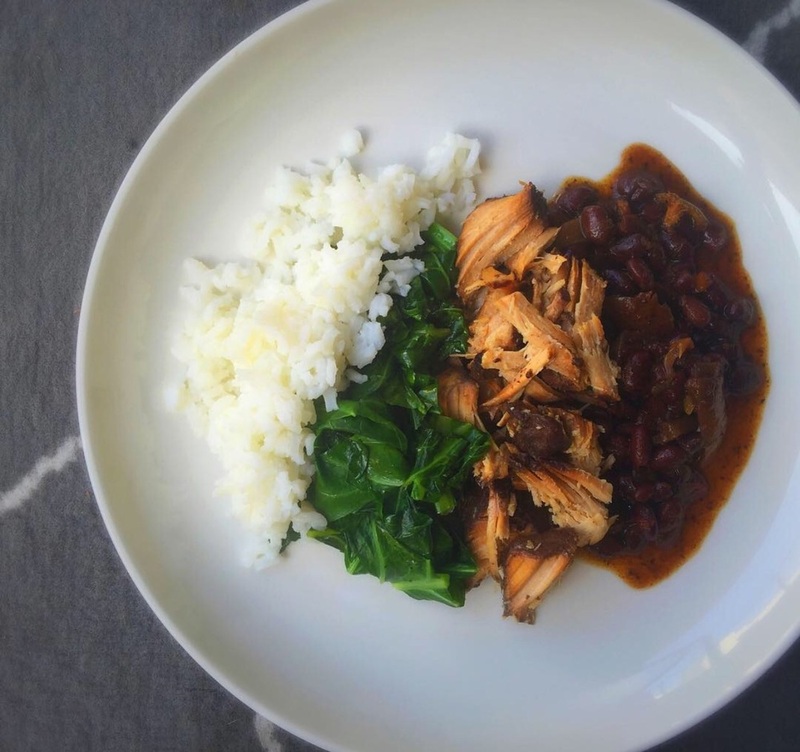 Feijoada - Brazilian pork stew with Rice, Beans, Collards. What do you think? It looks good huh? It was. Oh my goodness. It was soooooo freakin good! Nom Nom nom (pig in mud status). I'm making this again next week, and this time, I AM inviting my parents over for dinner; I think they will appreciate this dish. It's something very similar to what I believe them to make at home. *note- kumquat jam can be purchased at specialty stores. If you want to vary this, season pork with salt n pepper to taste and add 2 tbs of smoked paprika. Marinate overnight. The longer it cooks, the more the spices have time to penetrate the flesh and it gives it a great smokey flavor. Are you enjoying what I am writing? Why don't you join the mailing list? It's a good way to get cooking tips delivered to your inbox and also be part of the exclusive discounts and FREE giveaways.